This morning one of my friends got baptized and I cried. With change comes a heart of compassion. I remember being dunked in the water last year and what it symbolized for me. My friend Chris has had his fair share of crap that he brought on but also things that he didn’t ask for. There was a group of the churches youth up by the baptism water and a boy turned around and said sir why are you crying. I said I can’t explain it unless you’ve been there but that is what you call rising through the ashes. I hope you never get there but if you do remember God never leaves us! Pretty good little Sunday if I do say so. This is what I don’t have!! Okay Im not going to write what I don’t have sorry to let you down but Im going to write about the good I have in my life. This blog came on from a meme that I had saved on my phone. I was looking for a little encouragement yesterday after driving around for about 3 hrs cleaning my brain. I always used to be a glass half empty guy but im learning that its better to have a little than none at all. Its coming up on three years since my divorce and I won’t forget the way I felt standing in that courthouse. I had no idea which way was going to be up. I didn’t know how to be a dad, how to function on my own. 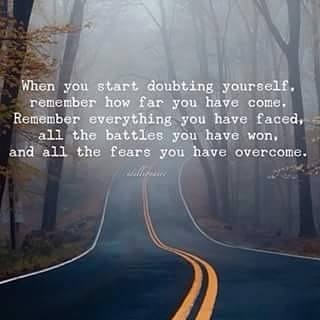 I doubted my self every second of everyday. Now almost three years later, sure I still doubt but it’s so many fewer times. Every time I turn it over to God its goes the way it should. I have won so many battles but not with people because if we win those we actually lose. I’m talking about the battles of the mind that tell us you’re not lovable, worthy, your not good at ABC. 3 years ago I feared my own shadow and now I welcome its company. I was reminded last night of things I forget about myself and about who I am and what I’ve overcome. It’s always easy everyday to wake up and say I can’t do this or I haven’t made any real changes. I would beg you to start everyday listing one or two things that you have overcome, a fear your overcoming, a battle within you that you have conquered. Your doing such an amazing job compared to what you think you are. For me, Everyday to be the best father and never be selfish, I’m learning to love me, I have a heart for God, to do something good everyday, to help at the drop of the hat to be there for someone, my fear of not being lovable, I slowly learning that be by myself is okay. Sometimes just keeping my head above water and not tucking tail and running. Providing you hope when you feel there is none is what I like the most. So today stop and recognize the things you have done and where you’re at compared to just one year ago. Be proud of yourself if that means you were at your rock bottom or there now , it only goes up from here. I’m living proof that the most broken, worst self esteem, pathetic man full of excuses can change and its been so worth it. Have you ever walked into a warm wet blanket. If not come to Texas now. Its hit 95 for three days in row and since we still have standing water everywhere it’s so humid. Parts of my body stick together that just shouldn’t. Since I’m bald when I sweat it looks like the beads of sweat are having races down my head. Anyway it’s hot we knew it was going to be but it just slapped us all in the face like when I used to talk back to my mom. Its hurts!! Carry on!! I always wanted to help people. When you help people you only picture the good that comes from helping. You really never see when lives go haywire, or people die and take their own life. I have been very blessed to get in front of 1 or 1000 and tell my story. I only know its powerful and life changing because I get told every now and then. We get to spend a lot of times with Addicts in Rock Bottom Outreach. All of us were an addict in some form or fashion so we know the brain and thoughts of addicts and what addictions can do. It can be one of the best life altering moments when someones light bulb comes on and they change their life. All I or we do is open our mouth and tell our story. God takes over from there. Seriously if we took anymore credit then its about us and I’ve played that game. I lost at it every time. What hurts the most when the light bulb goes out and it doesn’t come back on! Last Wednesday we lost another brother. In February we had an event where we cooked hot dogs and hamburgers and our friend showed up drunk. The great thing about him was that even though he wasn’t comfortable in his own skin he showed up to serve God drunk and all. He never hid from his demons but he couldn’t rid him self of them either. Our director and I talked that he was going down the path of suicide and what more could we do. The answer is what we do for anyone, love them, hug them, be real, be Jesus and the rest is not up to us. When you’re in this environment you see destruction and spiraling out of control you know whats coming. For me I was in the destruction and I just had one brief second where I heard God and I’m still here. My friend is not he hung himself in a tree on Wednesday. I wish I could tell you that the 50 or so people who I know that have been rescued through the destruction are the ones I only think about. It’s the one like my friend Coy that hurt the worst. He had called me in April around 10:30 and just wanted to talk. he was drunk but I actually at that moment needed someone to talk too. He spoke for about 10 minutes at the end of the conversation he said just let me quit! I told him I can’t do that I love you I’m here until you don’t want to fight the battle. It’s not my job to let you quit its your decision. That haunts my mind a bit even though I know I and we did all we can do. It’s not the ones we help it’s the ones we don’t that hurt the most. There is no life altering info I can give you except. There are people out there that want your life better, we are those people in Rock Bottom Outreach. No matter what we do sometimes the demons overcome even the best people. Reach out if you’re at the end, you’re not alone unless you choose to be. You have no idea how many people love you and would be so lost without you and I’m sorry we don’t tell you until you can’t physically hear it anymore. God said it would be worth it but not easy. today it’s not easy! !